It’s the holidays, and Christmas is just days away. Full disclosure, I’m a huge sucker for this time of year. We celebrate a lot of different things during this season, but Christmas is the one I grew up with, and so it’s the one I wish people. I love all the lights, I love that people seem to be finally able to let this warm kindness out of their bellies and out into the world shamelessly. Seriously, you should see the size of the tree that is occupying a good third of my living room right now. A couple of years back, I got to produce and direct a “holiday special” for the CBC. It was one of those gigs that stands out for all the problems that came with it and how our crew found a way to deliver something pretty damn great under fairly ridiculous circumstances. We even won a Canadian Screen Award for it. It’s airing again this year on Christmas Day, and I have friends who watch it with their kids every year. So, in some small way, I’ve become a part of that tradition. I don’t think we’ve necessarily landed amidst the classics like the Rankin Bass Rudolph, or Chuck Jones’ Grinch, but for a few kids out there, we’re part of their magic and future nostalgia. So, in that spirit, I’m going to try to share a few other Canadian Christmas Classics over the next few days. Some I’ve shared before, some you’ve likely never heard of, but whatever, there’s no scientific process behind these posts, just Christmas cheer. 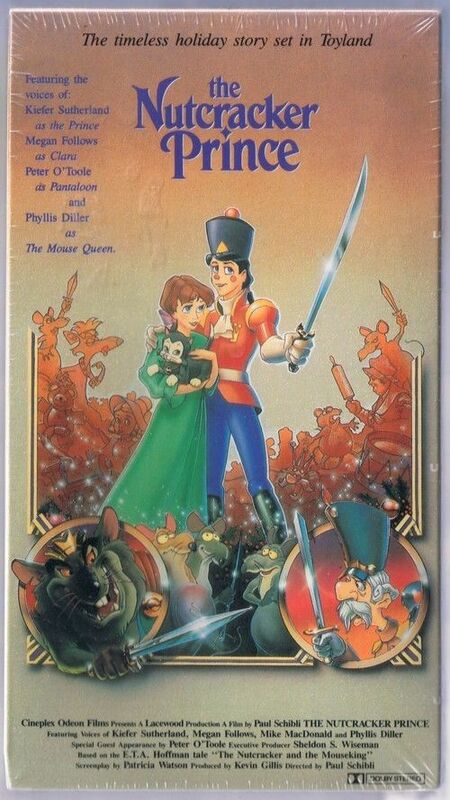 And first up is a super ambitious feature production that came out of Ottawa’s Lacewood Studios in 1990: The Nutcracker Prince! It was directed by Paul Schibli, and starred Canadian performers like Megan Follows, comedian Mike McDonald, and Keifer Sutherland. it’s worth noting that it also featured legendary comedic actor Phyllis Diller, and the greatest actor who ever lived, Peter O’Toole!!!! I’ve heard stories about this production, but those stories aren’t mine to tell. If anyone wants to reminisce, we have a comments section. Ok, enough of all this. Here’s the movie, as it can be found on Youtube. Merrymerry, everybody! This entry was posted on Thursday, December 21st, 2017 at 11:53 am	and is filed under showcase. You can follow any responses to this entry through the RSS 2.0 feed. I shot some of this! Wow! Blast from the past! Time is a wonderful distortion lens. I have very fond memories of working on this film though at the time it was very stressful and filled with many very long days. I got to work in several departments over the course of this film. Ink and paint, then colour mixing (there was a team of us having to mix the character colours from large batches of base paint. Messy job with a huge room filled with hundreds of gallons of paint),animation checking where we ensured proper leveling and labeling for ink and paint to do their job and my favorite, final check. The last stop before camera. This last job would get very complicated gathering all the elelments needed for the final shot and making sure it all worked the way the director intended. There was one massive shot in particular that took me weeks to get ready for camera. Not a long shot in the film but a scene where there were dozens of characters dancing at a ball. There was a small army of animators that worked on this shot as the dancers were split up into smaller groups to get animated. It was rotoscoped (I use the term very loosely) but very crowded on screen. during the animation clean up stage there were a few characters that eneded up switching body parts as they twirled around the dance floor. An arm would go missing, a head in one instance. It was a long pan shot so animated on 16 field-4 field pan paper. That meant each sheet was roughly 3 feet long and there were a couple of hundred drawings. 6 levels under the camera for every frame. There was no time to send anything back to get adjusted so I had to get creative with paint, knife and ink. In some cases cutting out an entire character to re-level in the shot so they went behind other characters correctly. On a per frame basis this meant some pretty strange cutting out of body parts to overlap the drawing on the cel. 6 levels was our max in order to avoid too much of a colour shift so I had to get pretty creative with solutions. Hope no one can tell in the end.